If you or a loved one struggles with epilepsy, are not a surgical candidate, and, have been failed by two medicines, a ketogenic therapy should be considered. The inspiration for the Charlie Foundation, Charlie Abrahams, was one such candidate. After attempting seven unsuccessful drugs and a failed brain surgery, his prognosis by the medical profession was life-long seizures and “progressive retardation”. Charlie started the Ketogenic Diet in 1994, and within days, his seizures stopped. He maintained the diet for five years, and has never taken another anti-epileptic medication. Today he is a pre-school teacher, and eats whatever he wants. He has never had another seizure. 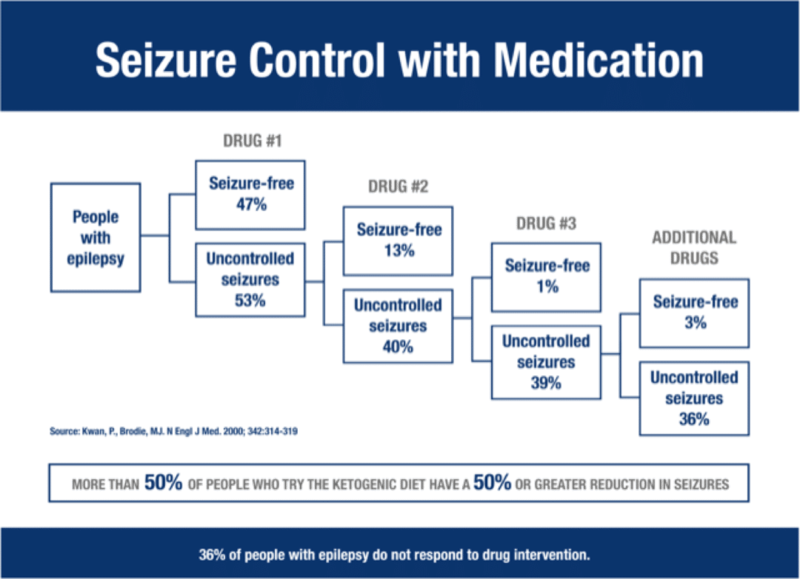 This chart demonstrates that after a first anti-seizure drug fails, there is a 13% change the second one will control seizures and a 1% chance the third will stop epilepsy. These statistics are unchanged for the past fifty years. As previously stated, studies show that the Ketogenic Diet is effective in reducing seizures in over half of people with epilepsy by over 50%. Up to 25% become completely seizure-free. Generally, the diet is prescribed to patients who have not responded to medication. One in 3 people with epilepsy do not respond to medication, resulting in a lifetime of uncontrolled seizures and pharmaceutical management. Only a small fraction of people with epilepsy are offered Ketogenic Diet therapies, even though the diet offers improvement to the majority of people who try it. As the chart above also indicates, only 47% of people with epilepsy respond to the first medication they are prescribed. Moreover, only 4% of people with epilepsy will find an effective drug therapy if they have been failed by two drugs taken at a time. Some studies show that combining medication with the Ketogenic Diet can produce better outcomes by decreasing seizures and/or reducing amount of medication needed.